Tokaj Wine Region is part of the Tentative list of Slovakia in order to qualify for inclusion in the World Heritage List. Historically, this site was a part of already inscribed The Tokaji Wine Region Historic Cultural Landscape (Hungarian WHS), which has quite low ratings in the comunity. It was divided after WWII negotiations, but there is still a controversy between Hungary and Slovakia about its status. 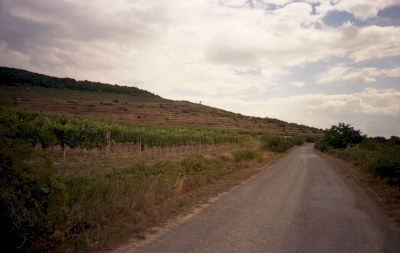 The Slovak part of Tokaj is relatively small and comprises only 7 vilages, and it was approved as the part of Tokaj tradition and business only recently by Hungarian side. However, this area of Slovakia is still inhabited by Hungarian minority that can comunicated in Slovak language only with limitations. The area was rather underdeveleped and abandoned as I could see during my visits in 2003 and 2013, but it might have been changed. On the other hand, the site was very tranquil and pleasingly non-touristy. I walked through vilages Velka and Mala Trna, where few wine cellars and wineshps could be visited, then we walked towards Cernochov and Bara vilages through wineyards (photo). Even though the Slovakia part of Tokaj is a landskape of certain natural and agricultural beauty, I do not think that its inscription would enriched the list - certainly not. It would be probably helpful for marketing of Slovak Tokaj wines. The question is if it is good or bad.